20 bands graphic equalilizer allowing you to save and restore response curves for calibration of sound capture devices, sound card, acoustics… by the measurement of a white noise. 3D spectrum analyzer allowing the recording of about 45 seconds of signal and the displaying of its spectrum analysis . 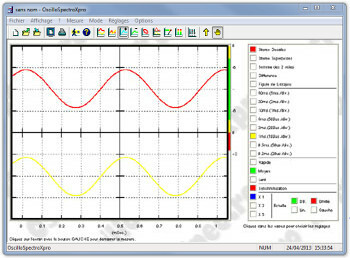 Exportation as an Exel file containing all the data of the capture, a 3 D graphic showing the complete analysis and the average spectrum analysis of the capture. When the file is opened in Exel you can make all modifications you want concerning the graphic (3 D move, scale, type of graphic, color etc..). All operations allowed by Exel are applying to your spectrum analysis. 6256 data available per spectrum analysis.